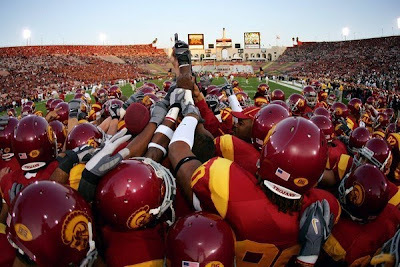 Unlike many self-assured USC fans, this season’s rocky ride was not a surprise to me. Nor was it as horrifying or depressing for me as it seemed to be for other fans. I think the secret to my success and perhaps the key to the Trojans’ struggles come from the same place: I am, after all, a teacher. I know that good football comes from much more than physical brawn, great play calling or time in the weight room. Remember that the legacy of a coach is only secured by your play. Reputations mean nothing. If you want to be part of a tradition, then you have to earn a place in it. Remember to learn from your mistakes, but never let them haunt you going forward or cast a shadow on your spirit. Take responsibility for each moment of the game, each moment of your life. Believe that every penalty is avoidable. Play as though you only had one play left, and live as though this is your last (and finest) day. Defeat is a state of mind. You win some, you lose some, but never allow yourself to succumb to defeat. Don’t buy into the hype. Humility, teamwork and training are the only things that get the job done. Buy into the hype, and it will poison the game for you. Aggressively seek out your own failings, even after you have found success. Know that the media, fans, and fair-weather friends who build you up need someone to tear down. It is part of the burden of having a successful program. Shoulder this load with good nature and view it as part of your weight training. Last, know that success is just a symptom of something more important: for the football team, it is a group of young men who are able to keep their spirits intact while learning some of the toughest lessons life has to offer. It’s what college is for, and it doesn’t make any difference if you’re a projected draft pick, a chemistry grad student or a cellist. The purpose is to become a balanced, productive person who knows that adversity is just another chance for us to experience triumph. If you look at it that way, you see that our battle cry of “Fight On!” isn’t about getting a first down or winning a championship. It’s about carrying on, and the manner in which you comport yourself in the face of your own failings. There is still time to win, on and off the field. NextThe 12 Days of Cellomas 2009 Fail-tacular! And I'm ordering 5 clatessus as stocking stuffers.